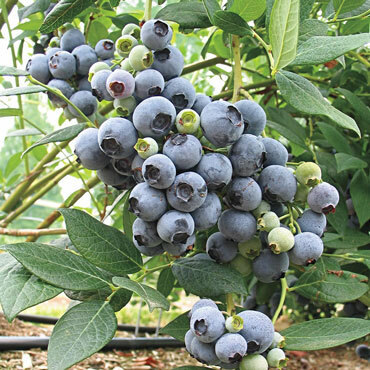 Camellia blueberries are large and excellently flavored, with a lovely, pronounced tropical fruit aroma. The berries will appear in large, tight clusters, with a sky-blue color when dusted with "bloom," the white powdery substance found on blueberries that indicates freshness. Camellia will consistently produce uniform berries from mid to late season, averaging 4.5 to 5 lbs per plant each year for 3-to-4-year-old plants grown in bark beds with irrigation. Keep the birds away from these delicious blueberries with our Bird Netting, which will prevent them from enjoying all the berries before you get the chance! Plant in acidic, sandy, moist soil with lots of organic matter, and be sure to give Camellia access to full sunlight. Zones 7-8. Zone: 7-8 Estimated 450-500 chilling hours. Foliage: Medium green foliage, topside of leaf is green, underside yellow, turning glossy-reddish in the Fall. Depth: Plant at the same depth as in the nursery. Days to Maturity: Fruit development period 64 to 69 days. Yield: Medium, averaging 4.5 to 5 lbs per plant each year for 3 to 4 year old plants grown in bark beds with irrigation. Fruit: Uniformly large sky-blue berries with excellent flavor and a very pronounced "tropical fruit" aroma. Soil Preference: Acidic, moist soil with lots of organic matter and very sandy. ph 4.5 - 5.5. Pruning: Prune out leggy small twigs for better berries. Form: Upright, spreading, and notably bushy growth habit. Pollinator: Self-fruitful, but cross pollination with other varieties will result in larger berries.